The Aurochs was a species of massive cattle that stood around 6.6 feet tall and was found across Asia, North Africa and Europe. Now extinct, the Aurochs is the common ancestor of today’s domestic cattle and was a prominent symbol in in range of independently diverse cultures. Depicted in cave paintings all over the world the Aurochs is believed to have been domesticated by a number of independent cultures around 8,000 years ago with the species dying out in 1627. 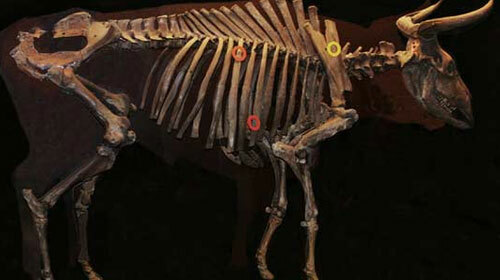 The last known Aurochs specimen was a female that died in the Jaktorów Forest, Poland in 1627. The skull of this last specimen is currently held in a museum in Stockholm. 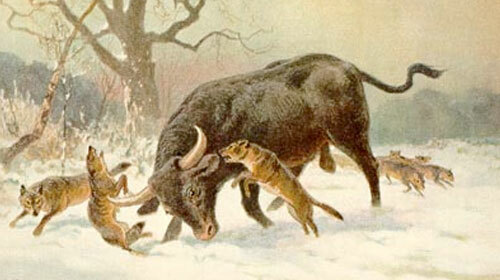 Over the years, specifically in 1920, the Heck brothers experimented with back breeding to try and produce an Aurochs. The result of the back breeding gave us the Heck cattle which is now found widely across Europe, so although the back breeding wasn’t entirely successful it was certainly useful. Although today’s species such as the Heck cattle aren’t as large as the Aurochs of age there are other similarities and its believed that differences between lifestyle are few. The Aurochs is thought to have preferred a habitat of wetlands and swamps and could swim for a short while leading to the colonization of local islands. It is likely that the Aurochs main diet consisted of grass, leaves and fruit. There are three known subspecies of Aurochs that pre-date the evolution of smaller cattle and the inevitable extinction of the Aurochs thanks to competition and hunting. These species were the Indian Aurochs, North African Aurochs and the Eurasian Aurochs who were the last survivors and who the specimens mentioned above belonged to. The Indian Aurochs is believed to have been the initial Aurochs species from which descended the North African Aurochs and the Eurasian Aurochs. This species of Aurochs is thought to have originated around 2 million years ago and eventually became extinct around 9,000 B.C. These Aurochs favored the dry desert habitat and remnants were eventually domesticated into the zebu. 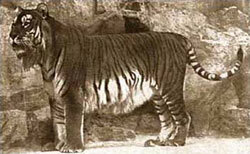 The North African Aurochs descended from the Indian Aurochs however favored a habitat of of woodland. The main reason for the extinction of the North African Aurochs was down to the expansion of the Sahara Desert and although the North African Aurochs was used as Egyptian cattle it was eventually replaced by the Zebu.